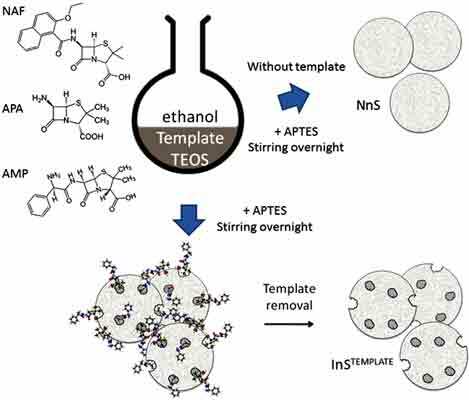 Different silicon-based xero-gel molecularly imprinted spheres in the nano boundary range with recognition capabilities for nafcillin have been synthesised, using tetraethylorthosilicate (TEOS) and (3- aminopropyl) triethoxysilane (APTEOS) as precursors. Imprinting has been achieved using both nafcillin (NAF) or structural analogous ‘dummies’ such as (+)-6-aminopenicillenic acid (APA), or ampicillin ((+)-6- aminobenzylpenicillin)sodium salt (AMP). Materials were fully characterized using ATR-FTIR, 29Si solidstate NMR, TGA, TEM and BET. Adsorption isotherms for all the materials fit with a continuous Freundlich model with correlation coefficients better than 0.988 and mean affinity constants between 105 and 106 L·mol-1. The use of ‘dummies’ as well as the template itself in the imprinting process resulted in materials with different release speed. Combinations of these materials allow designing mixtures with a continuous, controlled and constant release longer than four days. Thus, the non-imprinted and the AMP-imprinted material have a rapid release during the first five hours, nafcillin and APA imprinted ones release antibiotic mainly after a latency-period of 24 hours. Adsorption, Drug Delivery, Isotherms, Molecularly imprinted silica, Nafcillin, Nanospheres. Faculty of Chemistry, Department of Physical and Analytical Chemistry, University of Oviedo. Av. Julian Claveria, 8 33006-Oviedo, Spain.